IRTG 1243 members contributed poster presentations of their projects during the American Society of Hematology's (ASH) 60th Annual Meeting & Exposition from December 1-4, 2018 in San Diego, CA. 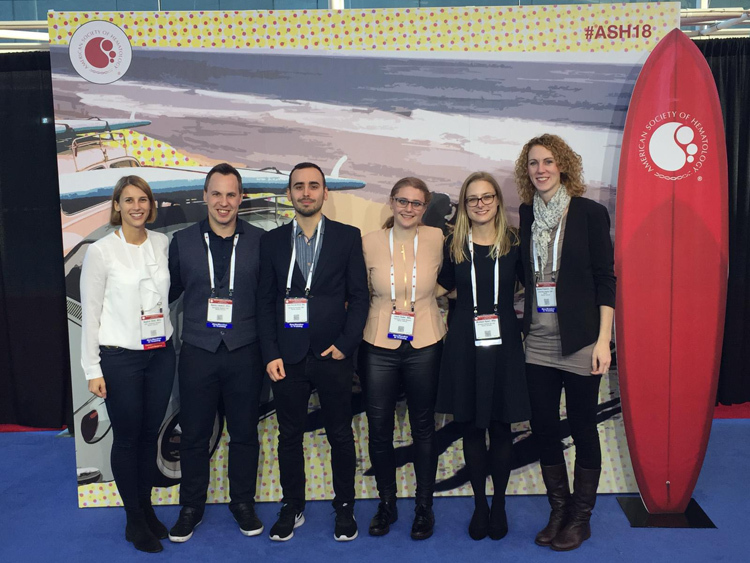 IRTG members send their greetings from the ASH 2018 meeting in San Diego: (from left) Sophie Stief (Spiekermann lab), Georg Leubolt, Enric Redondo Monte (both Greif lab), Laura Kuhn (Zimber-Strobl lab), Michele Kyncl (Götze lab), Dr. Verena Passerini (postdoc, Weigert lab). Not pictured: Bettina Brauchle, Anetta Marcinek (both Subklewe lab).